The people in the West have the habit of attributing every good thing to themselves and try to prove that it is because of them that the world got this blessing, otherwise the world was steeped in ignorance and completely unaware of all these benefits. Now let us look at the question of human rights. 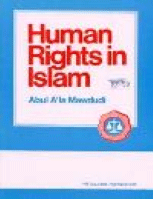 It is very loudly and vociferously claimed that the world got the concept of basic human rights from the Magna Carta of Britain; though the Magna Carta itself came into existence six hundred years after the advent of Islam.